A ragged geological scar crosses the belly of Mars. Long enough to reach from New York City to Los Angeles, this great rift in the martian crust is named Valles Marineris, or Mariner Valley. It was discovered in 1972 by the Mariner 9 spacecraft. 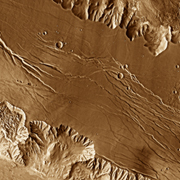 Formed out of several parallel, connecting troughs, Valles Marineris dwarfs Earth's Grand Canyon in every respect, being wider, longer, deeper, and older. It easily earns the title of Grandest Canyon of All. This mosaic image of Valles Marineris - colored to resemble the martian surface - comes from the Thermal Emission Imaging System (THEMIS), a visible-light and infrared-sensing camera on NASA's Mars Odyssey orbiter. Mars Odyssey was built by Lockheed Martin and the mission is operated by the Jet Propulsion Laboratory. Built from more than 500 daytime infrared photos, the mosaic shows the whole valley in more detail than any previous composite photo. Despite the valley's huge extent - including its western extension through Noctis Labyrinthus, it reaches some 3,000 kilometers (2,000 miles) long - the smallest details visible in the image are about the size of a football field: 100 meters (328 feet). Geologists think Valles Marineris began to open along geological faults about 3.5 billion years ago. The faulting was caused by the tectonic activity that accompanied the growth of the giant volcanoes in Tharsis, lying just to the west. As molten rock (magma) pushed into Tharsis from below, the entire region rose, and the surrounding crustal rocks stretched and broke into faults and fractures. As cracks opened, the ground sank, much as the keystone in an arch drops when the ends of the arch move apart. The faulting also opened paths for subsurface water to escape, undermining the ground and enlarging the fracture zone. In countless places, the valley's steep, newly exposed walls became unstable, causing landslides that widened the canyon further. It's not clear when the valley's growth stopped - and in places even today small landslides undoubtedly occur. But it appears the main activity came to a halt roughly 2 billion years ago. Within the valley lie several areas that show the stages by which it formed and grew. These examples have helped scientists understand how the valley came to be. Valles Marineris began to open in response to a slow, irresistible pull. As the tectonic forces building Tharsis tugged the martian crust, it cracked, leaving traces that run for hundreds of miles across the surface. The fractures seen here are remnants of a process that was once common over the entire region where Valles Marineris formed. The curving shape of these faults shows that the region did not move rigidly like a stone kitchen countertop. Instead, it behaved more like a big slab of Brownies that buckles and bends when you try to slide it off a cookie sheet. Another example of fracturing appears in northern reaches of Tharsis, where Acheron Fossae is sliced by dozens of curving faults. As the surface broke open, water and melting subsurface ice escaped and the ground collapsed, with portions of it washing away. Different parts of Valles Marineris provide snapshots of this process, caught in different stages. Here, for example, faults have opened into collapse pits, some of which then join to form larger depressions. The process steadily eats away at the surface until the land between two neighboring faults is all but destroyed. At the valley's eastern end, scientists see unmistakable evidence for massive floods. The ground here was so saturated that when the water escaped, the surface collapsed almost completely, leaving only isolated mesas and hills. Not surprisingly, scientists term such regions "chaotic terrain." The floodwaters eventually poured into the northern lowlands through several outflow channels. 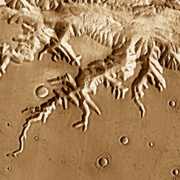 From the east end of Valles Marineris, the water flowed through a sequence of channels before reaching the Chryse basin. 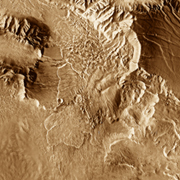 Northwest of Valles Marineris, a similar flood emerged from a depression called Echus Chasma to form the Kasei Valles outflow channel. A mystery remains whether these floods were single, overwhelming events in each channel - or a number of separate floods operating on lesser scales. The best evidence suggests the floods occurred in several stages, with at least one large outburst. The activity occurred over millions of years, but the episodes of flooding fall mainly within one period of martian history called the Hesperian. This was a transition time that followed the period of heaviest cratering and greatest volcanic activity, the Noachian. It comes before the "modern era," the Amazonian. The three periods take their names from specific locations: Noachis Terra, Hesperia Planum, and Amazonis Planitia. The Hesperian's timespan is known only roughly, but is thought to extend from about 3.5 billion years ago to perhaps 2 billion years ago. During this time, besides the massive flooding and the growth of Tharsis, Mars experienced a slowing rate of impacts making craters and basins, and the climate shifted to colder and drier conditions. Not all the erosion within the valley produced catastrophic floods. In places such as Louros Valles, where numerous tributary canyons cut into the valley's southern rim, canyon widening and erosion occurred on smaller scales. These canyons likely formed by the same method as the main valley segments - release of groundwater - but the quantity of water was less, the scale was smaller, and the results more localized. As geologists reconstruct it, water emerged from the canyon walls as springs and seeps and carried away sediment. In its wake, this sapping process left round-headed valleys that slowly retreated from the rim of the canyon. As faults and cracks in the rock guided the sapping, the growing valleys developed a characteristic tree-branch shape. It's worth comparing the tributary canyon seen here to the Grand Canyon in northern Arizona. The Grand Canyon is about 450 kilometers (280 miles) long, while this tributary is only 140 kilometers (72 miles) long. But where this valley empties into Valles Marineris, it is more than 3,800 meters (12,500 feet) deep - over twice the depth of Earth's Grand Canyon. Groundwater's effects can be seen also with the crater at bottom center. About 7 km (4.5 miles) wide, a wide skirt of thin debris with a raised outer edge surrounds the crater's rim. Scientists call this a rampart crater, and they believe the skirt shows the ground held a lot of water (or ice) at the time of impact. The heat of the blast released the water and lubricated the flying debris, producing a semi-solid splash pattern edged by the rampart, which is about 70 meters (240 feet) high. 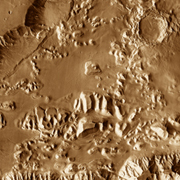 Undermined cliffs and valley walls are usually unstable, and Valles Marineris has grown wider in many places through landslides. This particular slide dropped thousands of feet and has a maximum length of about 100 kilometers (60 miles). A closer look at it shows that several landslides have occurred here, with each now slide lying on top of the previous ones. As examples on Earth show, landslides can travel great distances, especially when the debris contains trapped water or air to lower friction. Scientists think it likely that even the thin air of Mars would have contributed to this slide's remarkable run. 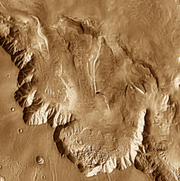 Similar, if shorter, landslides lie throughout most of Valles Marineris, and helped to widen the canyon as it developed. 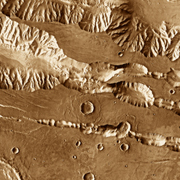 The Valles Marineris story involves more than just erosion, however. In places such as Melas Chasma (seen here) and in Candor Chasma and Ophir Chasma, the valley floor is piled deep with sedimentary deposits. Geologists call these the interior layered deposits. The origin - and nature - of these materials is perhaps the biggest mystery involving Valles Marineris. In places (Hebes Chasma, for example) the layers are stacked thick enough to reach almost to the valley's rim. They display eroded ledges and benches, buttes and mesas. In some places they have been covered by landslide debris. Where do the layers come from? The flat-lying, uncontorted layers suggest the deposits accumulated in a geologically quiet environment. This points to sources such as volcanic ash falling from the sky, or sediments piling up in a lake or large body of standing water. But if these are lakebed deposits, where the sediment originated - and how it got into the valley - remain unknown. Another enigma involves how wet martian history has been. The bottom of Ganges Chasma, a part of Valles Marineris, contains exposures of olivine-rich basalt. Olivine, a greenish mineral, weathers quickly into other forms when exposed to water. Its existence in Ganges suggests that the valley may have seen relatively little water over its history. But in other portions of the canyon system, such as Candor Chasma, scientists have detected clay minerals. These are evidence for extensive weathering of rocks and debris by water. Moreover, the water was less acidic than that which made the rocks found in Meridiani Planum by the Mars rover Opportunity. Because it is such a large feature, Valles Marineris obviously contains key pages in the history book of Mars. While scientists can write an outline of the planet's history, details stubbornly resist being fitted into a big picture. Whatever the story of Valles Marineris turns out to be, resolving these and other mysteries will give scientists a much better look at the history of this little red world next door to Earth.